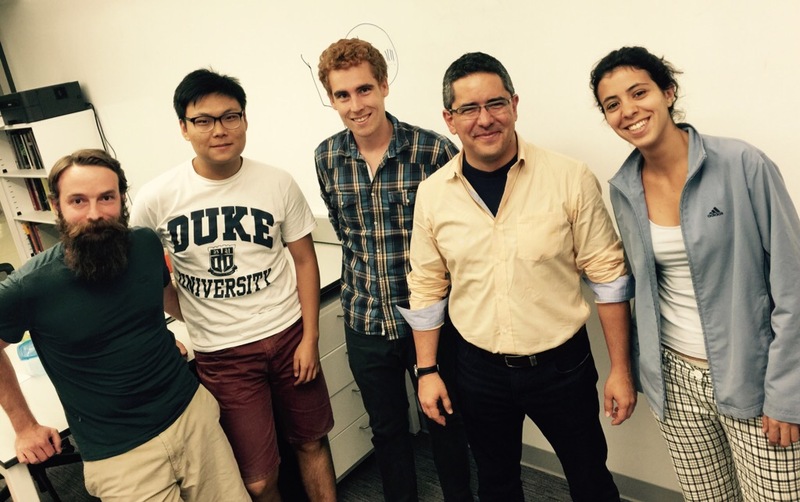 Fernando Perez visits the lab! From left: Gil Forsyth, Tingyu Wang, Olivier Mesnard, Fernando Perez, Natalia Clementi (August 2015). Lorena A. Barba, Associate Professor of Mechanical and Aerospace Engineering, School of Engineering and Applied Science, the George Washington University, Washington, DC. PhD Aeronautics, California Institute of Technology. BSc Mech. Eng., Universidad Técnica Federico Santa María, Chile. Member of the Board of Directors for NumFOCUS. Member of the editorial board for IEEE/AIP Computing in Science and Engineering, The Journal of Open Source Software, and The ReScience Journal. Personal Biography — includes bio for speaking engagements. See also About.me profile. Cris Cecka, Research Scientist at the Institute for Applied Computational Science, Harvard University (until Dec. 2014); now at NVIDIA Research. Hans Johnston, Mathematics and Statistics Department, University of Massachusetts, Amherst. Christopher D. Cooper, graduate student at BU —PhD (2015), MSc (2012) Mechanical Engineering, Boston University. BSc, PEng (2009) Mechanical Engineering, Universidad Técnica Federico Santa María, Valparaíso, Chile. After graduating, he became a faculty member at the Dept. of Mechanical Engineering at Universidad Técnica Federico Santa María (LinkedIn profile). Anush Krishnan, graduate student at BU —PhD (2015), BTech & MTech (2009) Aerospace Engineering, Indian Institute of Technology Madras, Chennai, India. After his PhD, he became a Senior Software Engineer at Exa Corp. He joined the startup nuTonomy as as software engineer in May 2017 (LinkedIn profile). J. Brent Parham, graduate student at BU —MSc (Dec. 2013) in Mechanical Engineering, Boston University. BSc (2010) Aerospace Engineering, Massachusetts Institute of Technology. Brent was a Lincoln Scholar at BU, and in January 2014 returned to his position as a staff scientist at the MIT Lincoln Laboratory (LinkedIn profile). Simon K. Layton, graduate student at BU —PhD (Sept. 2013) and MSc (2011) in Mechanical Engineering, Boston University. BSc (2008) Mathematics and Computer Science, University of Bristol, UK. Research intern at Nvidia, Summers 2011/2012. In September 2013, Simon became a DevTech Engineer at Nvidia, Inc., Santa Clara, CA (LinkedIn profile). Rio Yokota, postdoc (Feb. 2009–Sep. 2011) —PhD (2009) Mechanical Engineering, Keio University, Japan. In Sept. 2011, Rio became a Research Scientist at King Abdullah University of Science and Technology, KAUST, working with Prof. David Keyes. In April 2015, he joined the faculty at Tokyo Institute of Technology (LinkedIn profile). Alejandro Pelaez, undergraduate researcher, UROP awardee Summer 2011, Boston University. After graduating, he became a software engineer at Kayak (LinkedIn profile). Felipe A Cruz, graduate student at University of Bristol —PhD (July 2011), University of Bristol, UK. MSc (2007) Ingeniería Informática (Computer Engineering), Universidad Técnica Federico Santa María, Valparaíso, Chile. Until July 2013, Felipe was a postdoc at Nagasaki Advanced Computing Center with Prof. Tsuyoshi Hamada. He went on to a position as lead researcher in Square Enix (the Japanese video game company). In 2016, he was hired as Computational Scientist at the Swiss National Supercomputing Center (see the Staff page). 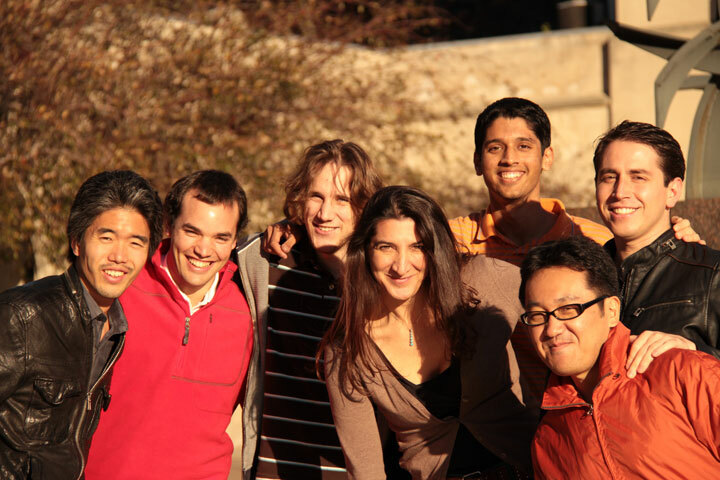 Rio Yokota, Christopher Cooper, Simon Layton, L Barba, Anush Krishnan, Tsuyoshi Hamada, Felipe Cruz (Boston, 2011).